To make a gift of any kind to The Marine Mammal Center is an act of generosity. To make a long-term gift – one derived from the work of a lifetime – is to make a commitment beyond measure. Because of the support of people like you, for more than a quarter century The Marine Mammal Center has been fortunate to count on supporters who share our commitment to the survival of marine mammals and the conservation of their ocean habitat. Among those members and friends, some make the most lasting gift of all by remembering the Center in their will. The Steller Legacy Circle was created to recognize and honor our special friends who have chosen to include the Center in their will. Just like you, they come from all walks of life. And like you, they share an intense desire to support the rescue, rehabilitation, and release of marine mammals, scientific research, and educational programs, to increase public knowledge and awareness of marine mammals as a critical link to the health of the oceans and the survival of all life on earth. The Steller Legacy Circle is named after Georg Wilhelm Steller, an 18th-century naturalist who researched and named, among other animals and plants, the Steller sea lion. You are eligible for membership in the Steller Legacy Circle simply by informing us that you have arranged to include The Marine Mammal Center in your will or estate plans. Establishing a plan that best suits your needs and fulfills your charitable wishes takes time and expertise. We encourage you to discuss these and other options with your tax or legal advisor for further details and to determine which options are best for you and your family. We hope you will join this extraordinary circle of friends of marine mammals to continue your support to a cause that has been important to you. Have you already included The Marine Mammal Center in your will or other estate plans? Please let us know so we can thank you personally and officially welcome you to the Steller Legacy Circle! You may also refer to this printable sheet to share with your attorney or financial planner. By participating in the Steller Legacy Circle, you extend your commitment to the survival of marine mammals and the conservation of their ocean habitat far beyond your own lifetime. Invitations - You will be invited to events at the Center and to attend a special release of rehabilitated animals back to the ocean. Listing in the Center's Annual Report and other publications. (If you prefer to remain anonymous, we will respect your wishes, but please let us know). "When something speaks to your heart, you want to protect it and watch it grow. That's why I have included The Marine Mammal Center in my estate plans. It pleases me to no end to know that my family and the organizations I love will thrive long after I'm gone." Many people want to do even more for marine mammals and our oceans and include a gift in their will or estate plan. If you have questions, or would like to discuss the different ways of making a legacy gift to The Marine Mammal Center, please contact Bess Touma at (415) 289-7331 or email toumab@tmmc.org. A charitable gift annuity (CGA) is a contract between an individual and a charitable organization. It is not an insurance product. An individual transfers cash or another asset to a charity, and the charity then becomes obligated to pay an annuity to the individual based upon the terms of the contract. The Marine Mammal Center does not issue CGAs, but you may establish a CGA that benefits The Marine Mammal Center through selected community foundations or through CGA America. A bequest to The Marine Mammal Center can be accomplished with a simple statement in your will, or in a codicil to an existing will, or a revocable/living trust. "I give and bequeath to The Marine Mammal Center, Sausalito, California, the sum of $___________ to be used for the general purposes of the organization." "I give and bequeath to The Marine Mammal Center, Sausalito, California, ____ percent of the rest, residue, and remainder of my estate to be used for the general purposes of the organization. Their Federal tax id number is 51-0144434." If you wish, you may designate that your gift be used specifically for animal welfare, veterinary science, or educational programs. The creation of a Charitable Remainder Trust, either during your lifetime or through your will, allows you to convert highly appreciated assets such as stocks or real estate into tax-sheltered income. By establishing a Charitable Remainder Trust, you can support The Marine Mammal Center, defer capital gains taxes on the sale of Trust assets, provide an immediate charitable income tax deduction if the gift is made during your lifetime, reduce estate taxes upon death, and provide a spendable income for yourself or other beneficiaries you choose. It may sound complicated, but it's actually rather simple. Money, securities, or other property are transferred to a trustee (that could be you) who will manage the assets and pay an income to you (or someone you designate). When the trust terminates, the trustee transfers the remaining principal to The Marine Mammal Center. You can add The Marine Mammal Center as a beneficiary on life insurance policies, retirement accounts, IRA accounts, Donor Advised Funds, etc. Our Federal tax id number is 51-0144434. 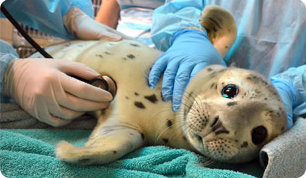 Want more information about including The Marine Mammal Center in your will or legacy plans? Or want to let us know you have added the Center to your will or legacy plans? Just provide us with your name, email address, and phone number. Download a printable version of this form. Or for assistance, contact Bess Touma at 415.289.7331, toumab@tmmc.org.